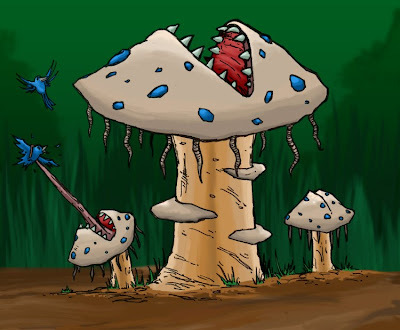 Strange, carnivorous fungi, native to a far away island. Tales of such plants were whispered as rumors for years before proper scientific classification. The Polyphagi makes it's home on the dry forest floor, slowly feeding off the of the usual rotting matter which accumulates there. This particular fungus has a strange, mouth-like orifice, and a shooting tongue similar to a Chameleon's with which it uses to catch prey. Although most grow to only a few feet, larger specimens have been shown to reach 30 feet or more. 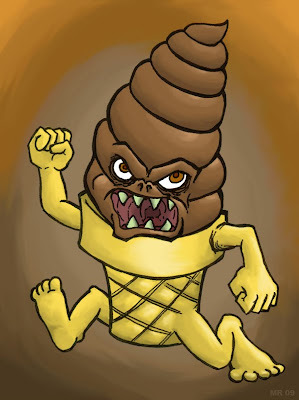 An anthropomorphic ice cream cone from another dimension. In his home world, the being known as Evil Creme lead a happy, joyous life, singing songs and gallivanting daily with his friends. Through a freak accident of nature he found himself stuck in our dimension. Having long since given up any hope of going home, Evil Creme now spreads fear, determined to stop the "animals" from devouring his own kind. 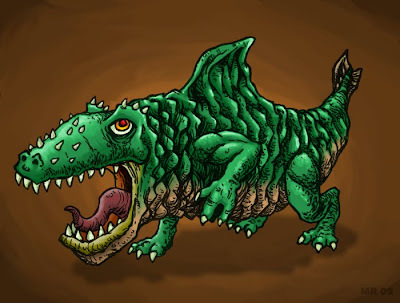 Landsharks are large, carnivorous beasts which can move through loose soil as easily as a fish swims through water. Landsharks spend most of their time above ground, and only submerge when hunting. They can be avoided by remaining on solid rock on on the roofs of buildings. 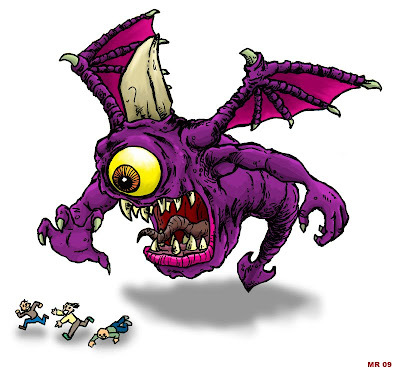 Vagarites are strange multidimensional entities which feed off of fear, pain, and anger. They are intelligent, however their throught process is so unlike ours that their behavior appears savage and animal. 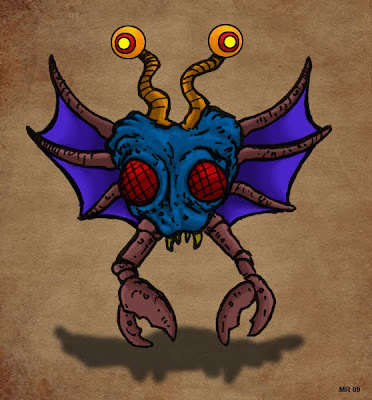 Vagarites hunt through the higher astral planes, invading the minds of sentient creatures. They influence and manipulate their victims into perpetuating acts of cruelty and violence, as to create more food for themselves. The Tomte is a Scandinavian household spirit. 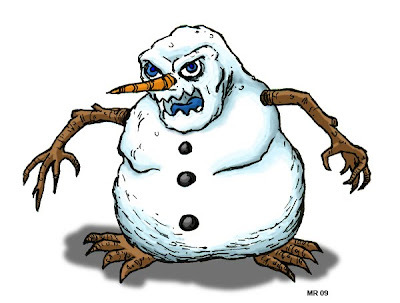 If treated correctly a Tomte will adopt a farmer's home and protect it from misfortune, if offended he will seek vengeance with elaborate, devastating pranks, and violent attacks on people and livestock. Tomtes are shapeshifters and can appear in any number of guises, the most common being a small old man ranging from a few inches to a few feet in height. They traditionally take up residence in the space beneath the floorboards. One who spilled liquid in the house was advised to shout a warning to the Tomte living below. In modern Sweden, the Tomte has been associated with Christmas, a character similar to Santa Claus. 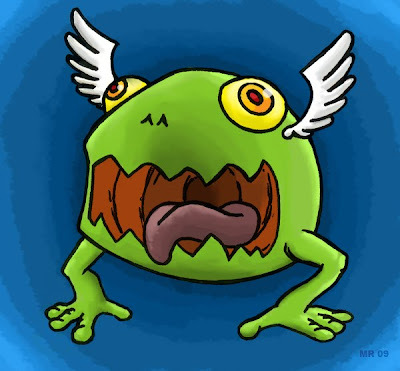 Mutated, two-legged, flying amphibians, Frog Balls are walking eating machines. They have been known to consume everything from insects to large dogs, and there are reports they have even attacked children. In the adult stage the small wings are vestigial, however young Frog Balls are able to achieve flight. 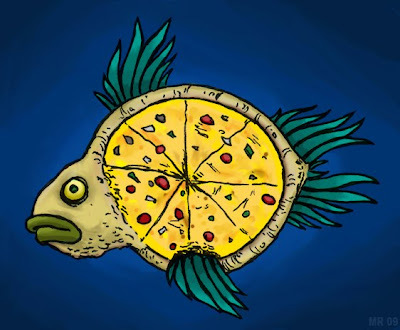 Sometimes a fish is just a fish. Small, fairy-sized dragons with butterfly wings. 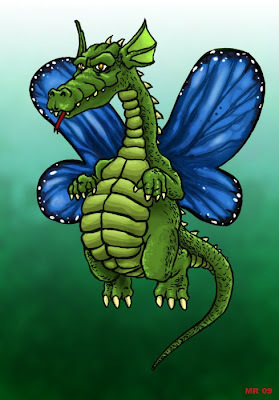 Dragon Fairies are often used as mounts and beasts of burden for the diminutive folk. As they are rather intelligent themselves they can be hard to tame, but will respond to food. 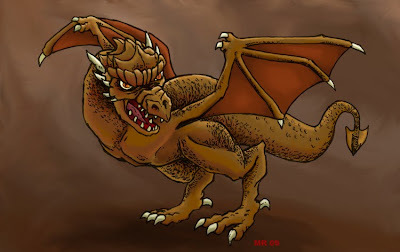 Cryptozoologists have theorized that the Wyvren may have originated from sightings of pterosaurs or other ancient flying reptiles. 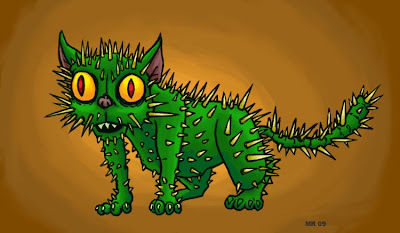 The Cactus Cat is one of the Fearsome Critters, legendary creatures of the American folklore. This strange cat had spines growing all over it's body like a cactus, and it enjoyed consuming the fermented juices of the saguaro cactus. It would often position itself to be right under someone as they attempted to sit down. Skibblers are strange monkey-like organisms, with limited intelligence and a vast ability to get into trouble. They grow to around 1-3 feet tall, and make their homes in deep forests, but have been migrating into urban areas. 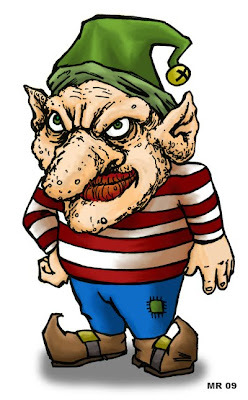 Skibblers are obsessed with shiny things, and have been known to break into houses to obtain jewelry, baubles, coins, etc. Their highly dexterous fingers allow then to open doors and windows. Males collect shiny objects to attract females. Skibbler dens found in the wild can be treasure troves filled with valuables. The Basilisk begins it's life cycle as an egg impossibly laid by a rooster, which is then incubated by a snake. The resulting creature is so incredibly venomous that even it's gaze can poison and kill. As it walks it's breath dries up the grass and vegetation around it, leaving trails of death in it's wake. 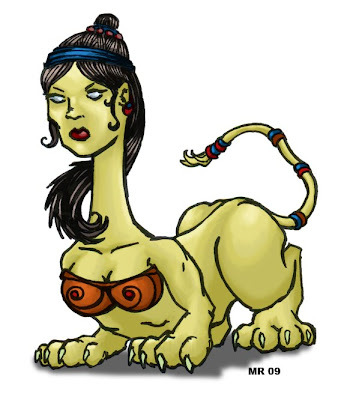 Modern folklorists have theorized that stories of the Basilisk may have sprung from accounts of the Indian spitting cobra. 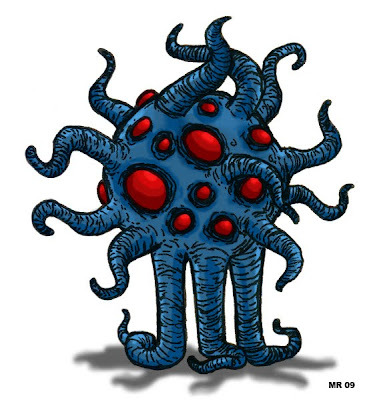 The Telpollyop is a species of strange, space borne fungus that originated from outside of our galaxy. They begin life as dormant spores which are blown along by solar winds. The spores then latch onto rocks or barren moons, and then enter a stationary barnacle-like stage, where they feed upon the minerals. Space faring races are well aware of the dangers of "space barnacles" growing on their hulls. Telpollyops can remain in this stage for thousands of years, and can grow incredibly large - some specimens have been observed to be half a mile or more. 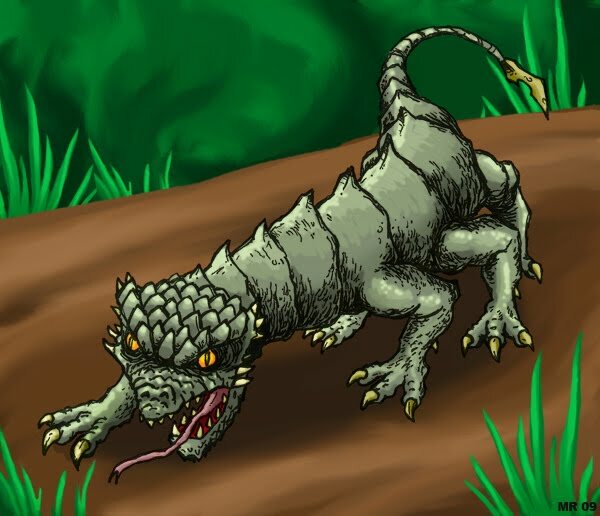 During the final phases of it's life, the Telpollyop transforms again into a mobile, animal form. Individuals undergo ritualized combat for the rights to mate. Such combat has been known to decimate settlements (due to the size of the combatants.) After it's mating cycle is complete, the Telpollyop expires, then the reddish egg sacks rupture and launch the spores to begin the life cycle anew. 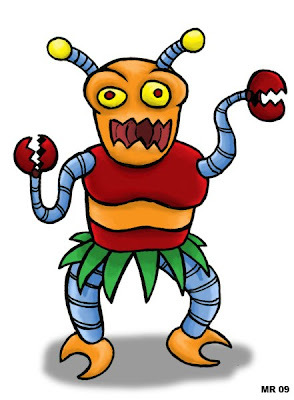 Flugaboo is a very confused alien robot thing. He does not know who he is, where he is from, or why he dresses that way. 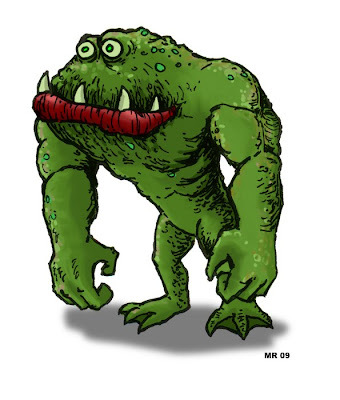 Flugaboo is in fact, immortal, and comes from a proud race which at one time dominated the known universe. He is however the last of his kind, stricken with amnesia, and now makes a living doing bad stand up in nightclubs in the seedier parts of the galaxy. Frogladytes are short, broad, strong, primitive frogmen, who live in underwater caves in the deeper parts of the Amazon jungle. They rarely venture to the surface, and subsist on a diet of fish and lichens. They have been known to venture out and abduct human women and children, but the purpose of these raids is unknown. Strange, energy leeching parasites, the Skolloptri are one of the few extraterrestrial animal species adapted to live in the vacuum of space. 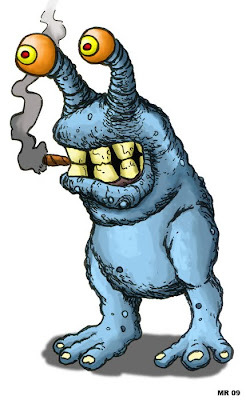 They live in large community warrens on desolate moons and asteroid belts. The large, red, eye-like protrusions on the creature's body are actually organs to collect solar energy. They have been observed migrating inbetween star systems and are estimated to live hundreds of thousands of years. 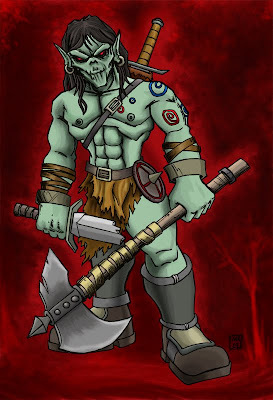 Orcs were originally envisioned by J.R.R. Tolkien in his celebrated Lord of the Rings trilogy. Tolkien may have derived the word from "Orke," which in old English described a giant, ogre, or troll. In fantasy fiction, Orcs are usually large, strong, barbaric humanoids with traits of various animals (fangs, snouts, pointed ears, etc.) Tolkien's orcs were the bastardized twisted spawn of tortured Elves. They tend to be cleaver but generally less intelligent than human beings, usually in service to a more powerful evil force (wizard, demon, etc.) and always attack en masse. 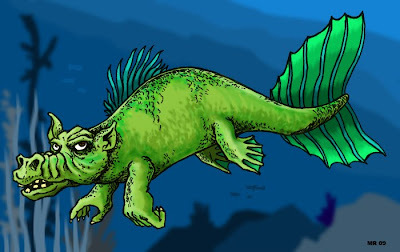 The Ambize (otherwise known as the Hog Fish) is a strange aquatic creature with a Pig-like face and hands like a human being instead of flippers. 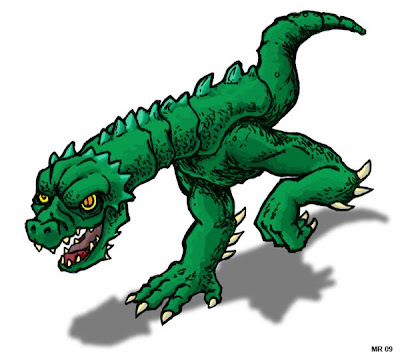 The first recorded sightings of the beast come from 16th century European explorers off the coast of Africa. Local fishermen held the beast in high regard, the flesh of which supposedly tasted better than the best pork. Crytozoologists believe the these may be early reports of a manatee. There is a high instance of tobacco use among their kind. 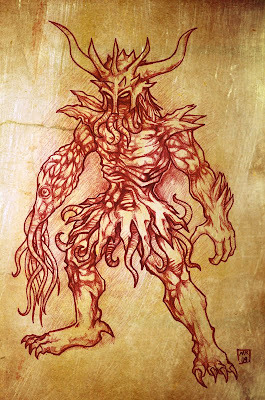 Gug smugglers are among the many races which illegally visit Earth on a regular basis to obtain such contraband. Strange cycloptic creatures from deep in the Amazon, the Flowerpillar has a very long maturating cycle, and eventually grows between 3 - 7 feet long. Most of it's life however is spent in the developing stages where it is vulnerable to predators. The Flower-like appendages around it's single eye act as camouflage. 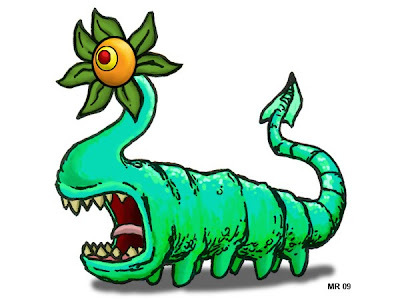 It has been suggested that the Flowerpillar is merely the larval stage of another creature, and the true adult Flowerpillar has not yet been observered. The Balloon Bug was nicknamed as such due to strange balloon-like glands on the creature's back. 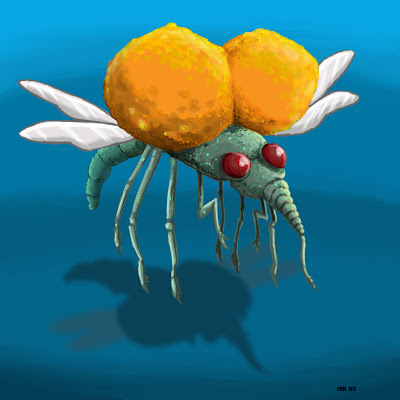 The glands fill with a lighter than air gas, which allows the oversized insect to achieve flight. The wings are for propulsion and steering. The Balloon Bug can go into a "stealth mode," by fluttering it's wings quietly, which is the usual method used to attack to sleeping prey. 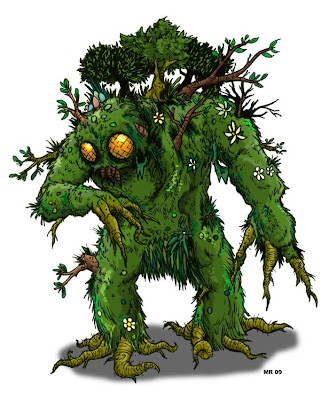 A MarshRot is a gigantic piles of fetid, stinking vegetation. The exact method by which these masses of swamp form and move about remains a mystery. They possess a rudimentary "skeletal system" of roots and vines, which clump together pockets of soil upon which other plants grow in a symbiotic relationship. The only animal element of the creature seem to be it's eyes, which are of an insect-like nature. 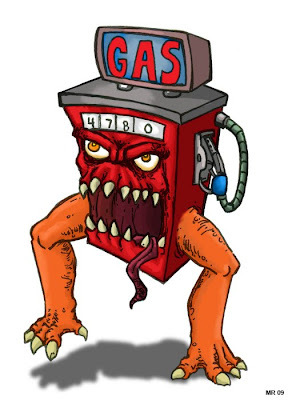 A Tsukumogami evolved from a Gas station pump, the Gas Man is more than happy to fill up your giant guzzling Sport Utility Vehicle. Although you may flirt with hybrids or small sporty fuel efficient cars, he knows you'll never be completely free from his influence. Small, quick moving reptilian demon-spawn that act as couriers in Hell. 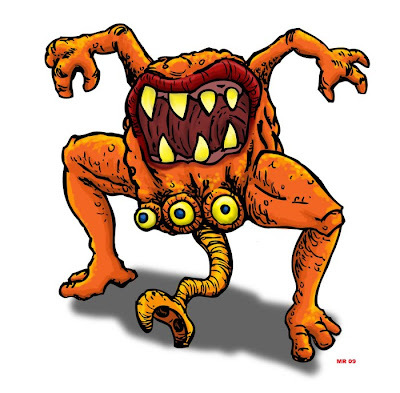 Vile Runners are able to instantly commit any message given to them to memory, and can repeat it back with the exact tempo, voice inflection, and tone. Their small bodies are built for speed. Although there is a general order to allow them free passage from battlefield to battlefield, not all creatures in Hell care to follow the rules. When the Greek hero Odepius answered the riddle correctly, the Spinx threw herself from a high rock and died. 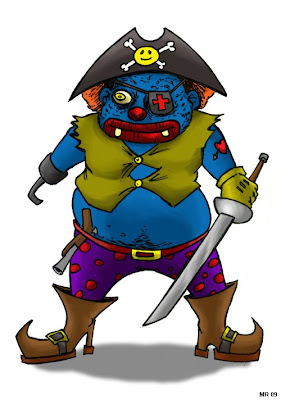 Pirate Clowns are not scary. Gnomes spring from European (particularly German) mythology. 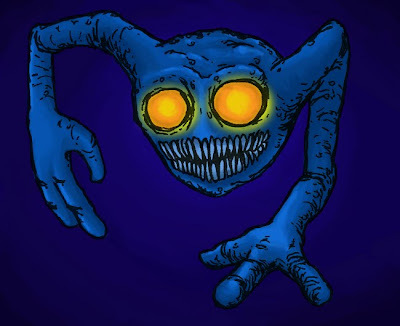 They are similar to various types of other household spirits of the times such as browines, nixies, goblins, etc. The modern conception of a "Garden Gnome," evolved in the city of Colonge where they are called "Heinzelmännchen," nocturnal helper spirits that tended to the gardens after hours. 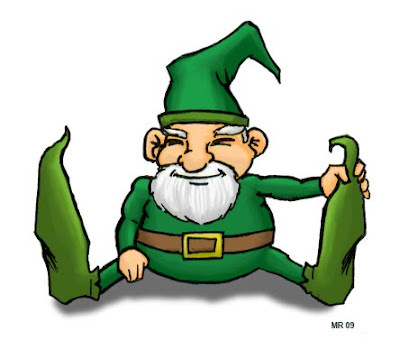 In fantasy fiction, Gnomes are generally seen as a friendlier offshoot of Dwarves, generally depicted as shorter, whimsical, jolly, with the characteristic long beard and pointed hat. In demonology, Barbatos is an Earl and Duke of Hell, ruling thirty legions of demons and has four kings as his companions to command his legions. He gives the understanding of the voices of the animals, says past and future, conciliates friends and rulers, and he can lead men to hidden treasures that have been hid by the enchantment of magicians.